Listening to The Guardian’s Barry Glendenning talk on the paper’s Football Weekly podcast about about how much his mate hated playing under Gary Megson â€“ Megson reputedly made said player trade in his Porsche for a shitter car â€“ made me think that perhaps I was being a bit harsh on Bolton fans, who didn’t exactly support their new boss at the weekend. 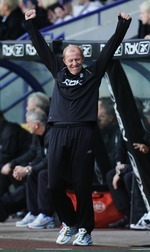 Glendenning also reminded us that Megson’s record as a manager in the Prem reads: Played, 48; Won, 7. That’s a diabolically bad winning percentage, although to be fair he didn’t exactly have a showroom full of Porsche-quality players at his disposal when he was boss of West Brom. It must feel to Bolton fans as if all of Big Sam’s hard work in getting their club to a ‘safe’ position in the Premier League has been for absolutely nothing. The cautious appointment of Little Sam has set the club back five years, and I’m afraid Gary Megson is not about to change that. What a difference a manager can make.